Hot Foot Bird Netting is great for excluding birds from open and semi-enclosed areas. But what about high-traffic areas like doors and other large entranceways? Hot Foot created an innovative line of bird and bug screens to keep birds from getting in through open doorways. Designed in-house to meet the demanding needs of our clients, Hot Foot designs commercial-grade products including fine stainless steel, aluminum, and vinyl-coated polyester; high-quality roll-up mechanisms; sliding screens; and heavy duty PVC exclusion strips with or without mesh material inserted. Best of all, Hot Foot bird and bug screens are made to order. Choose the exclusion method and style you want, send us the dimensions, and we will custom build your screens. Install yourself, or have it installed by a member of our nationwide network of trained installers. We will even help you choose the exclusion method that is best for you - simply contact us for a free consultation or call us directly at (800) 533-8421. Let in the fresh air and sunlight, but keep the birds out with the Hot Foot Rollup Door. Our doors provide the ultimate in bird deterrents without reducing ventilation, natural lighting, productivity, or employee comfort. The hallmark of Hot Foot Rollup Doors is their sturdy construction for high-traffic commercial and industrial use. The doors held securely on the sides by a sturdy, safety striped channel guide with a flared top for ease of operation, with your choice of wall or header mount. The header mount has a vinyl flap to seal the top to complete the insect exclusion package, while the wall mount features a vinyl strip to attach to the guide track using Velcro to seal this gap against insect and bird penetration. That means you can move in and out effortlessly while shutting the door on birds! Horizontal wind reinforcing bars are fitted to give added strength to the product in windy conditions and a “breakaway” feature allows these bars to pop out of the track if subjected to high winds or collision to reduce damage to the screen and mechanisms. With Hot Foot Rollup Doors, you also have a choice between lighter insect exclusion mesh or our sturdy Metalmesh stainless steel mesh - similar to security mesh - for heavy-duty applications. Our doors are available in four configurations: motorized, hand crank, chain hoist, or spring action. During winter when the weather turns cold and nasty, the mesh panels can be removed and replaced with clear PVC panels that are included with your purchase. Just slide out the mesh which allows wind and ventilation to enter and replace with solid, clear PVC to lock out those winter chills. This model comes with an in-tube motor (ITM), suitable for lower traffic areas (8 or fewer openings per hour) or an external continuous-duty motor (ECD) designed for frequent opening and closing. The door is operated from a rocker switch which is provided. Both motors have up and down limit switches, and the ECD model has an emergency chain hoist. Suitable for insect mesh and Hot Foot Metalmesh doors. Like a rollaway blind, this model rolls on a spring action tube and has two handles to manually pull screen into the down position. Two latches are provided to hold the door securely down. The spring assembly comes heavily lubricated, suitable for commercial applications. For insect mesh doors only. This model operates like a traditional chain hoist roll-up loading dock door. Suitable for both insect mesh and Hot Foot Metalmesh doors. This model has an awning type crank handle mechanism which can be cranked by hand or adapted for a hand drill. Suitable for both insect mesh and Hot Foot Metalmesh doors. 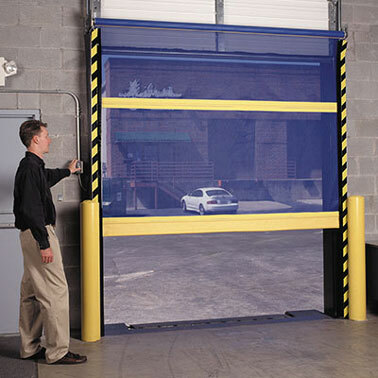 Protect any doorway size from 6ft to 60ft to aircraft hanger size, allowing employees and equipment to move in and out when they need to, and keeping birds out when they don't. Our slide-away design makes enclosing any doorway economical, allowing fresh air and sunlight in. It's like a giant porch screen door on your commercial or industrial building! Hot Foot Strip doors provide a cost-effective way to enclose small- to medium-sized openings that easily let you in while keeping birds out. Choose from a number of custom configurations, from traditional strip doors made from clear PVC to colored strips, "swing hinge" strips that allow easier movement, ribbed strips for high traffic areas, and USDA/low temp strips for food handling and refrigerated areas. Hot Foot designs truly custom exclusion door options for our customers! Hot Foot Combo Doors combine insect exclusion mesh with heavy duty PVC (clear or black or other color) to reduce damage caused by forklift trucks and other equipment traffic in lighter traffic areas. Keeps areas enclosed but allows equipment to move freely from area to area. Hot Foot Hybrid Doors work on a similar principle, but are designed for higher traffic areas. 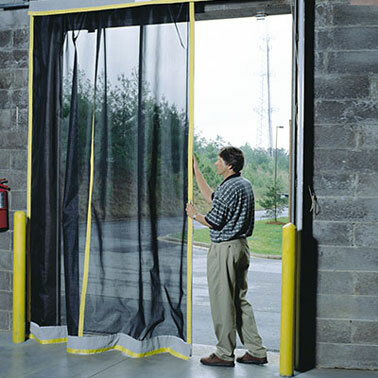 These hybrid doors are constructed of insect exclusion strips down the sides, and heavy-duty, see-through PVC down the middle forming the upper portion of the strips, and heavy duty PVC on the lower portion to allow easy movement of equipment and personnel from one area to another while providing a barrier against birds and insects. If you are looking for a truly custom solution, chances are we can design and build a bird and bug screen door solution to your specifications. Contact us for a free consultation or call us directly at (800) 533-8421. Hot Foot bird and bug screens are made to order. Choose the exclusion method and style you want, send us the dimensions, and we will custom build your screens. Install yourself, or have it installed by a member of our nationwide network of trained installers. We will even help you choose the exclusion method that is best for you - simply contact us for a free consultation or call us directly at (800) 533-8421.